This series outlines best practices for Guide managers who want to use the insights provided by Google Analytics to create the best self-service experience possible for customers. Zendesk Support's own analytics are a great place to start. But let’s face it, Google knows a thing or two about analytics. The Google Analytics service it provides has tools for everything from search analytics to ticket-deflection tracking. You can use these tools to improve your self-service option and make it easier and faster for your customers to find answers. This is the first article in the series. It outlines how to use Google Analytics to answer questions you may have as a Help Center manager responsible for providing an effective self-service support option to your customers. How many of my customers use self-service? How engaged are the customers who use self-service? Should I tailor my content for new or existing customers? Should I improve my site navigation? Should I optimize my Help Center for mobile devices? The series only scratches the surface of the things you can do with Google Analytics. There are plenty of resources to learn more. After you're finished here, another great resource is Occam’s Razor, Avinash Kaushik’s blog on everything web analysis and analytics. Before you do anything, enable Google Analytics in your Help Center. See Enabling Google Analytics. In your Google Analytics dashboard, navigate to Audience > Overview. The Audience Overview page provides high-level metrics about users of your Help Center. It’s important to measure if you're actually achieving what you set out to change, especially when you’re launching your Help Center. You can use the user metrics to track and trend how your customers are interacting with your Help Center. You can also gauge whether the updates you make to themes, navigation, or content actually improve the self-service experience for your customers. The following sections describe how to use the Google Analytics dashboard to answer questions you have as a Help Center manager responsible for providing an effective self-service option to your customers. Users is the number of unduplicated (counted only once) users of your Help Center over a specified time period. Zendesk Support’s Help Center analytics tracks the number of article and question views, but a customer may view multiple pages during a session. The Users metric counts each session as one session even if the customer views multiple pages. The information helps you understand how many of your customers are actually using your self-service offering. Keep an eye on this metric over time to see trends. For example, which days get more Help Center users? Is the number of users increasing as your customers become more familiar with your Help Center? To calculate your score, take the total users of your Help Center from Google Analytics, and divide it by the total unique requesters in tickets. Compare your score with the Zendesk Benchmark Report discussed in this blog post to see how you stack up against your industry peers. For example, a ratio of 4.1, means that for every four customers who attempt to solve their own issues using self-service, one customer submits a support request. Avg. Session Duration is the average duration of a session in your Help Center. It measures how much time on average a customer spends in your Help Center during one session. The metric is a good measure of the level of engagement when your customers are seeking self-service. The average session duration depends on your use case and your customers. For example, the average session duration of B2C businesses in the retail and telecommunication industries may be shorter than B2B businesses that have customers with more complex questions. % New Sessions is an estimate of the percentage of first-time sessions to your Help Center in the period selected. Knowing whether your customers are new or returning visitors can help you better tailor your content to meet their needs. Often, the majority of sessions for B2B and internal use cases are returning customers. These customers are more accustomed to skipping through superfluous introductory content to get to the articles that answer their in-depth questions. If you know most of your users are returning customers, you can use your Help Center as another vehicle for delivering relevant news and announcements. On the other hand, if you have a high number of new customers, you may want to tailor your content for users just getting started with your product or service. You can also drill down in the % New Sessions metric by Help Center categories, sections, articles, or questions. Use the information to map the content that's used by first-time users and returning ones. One way to determine whether or not your content is relevant for your customers is by measuring the opposite -- how irrelevant is it? Bounce Rate is the percentage of single-page sessions in your Help Center. A "bounce" means the customer left the first page without engaging with the page. Customers may leave after viewing only one page for different reasons. Maybe they couldn't find what they needed, or maybe the first page had everything they needed! How can you tell the difference? For articles, it’s completely acceptable and expected to see a high bounce rate. Customers may be finding what they need in the article and getting back to work. For "table of contents"-type pages that link to other articles, a high bounce rate could mean customers aren't finding what they're looking for. In the Google Analytics dashboard, navigate to Behavior > Site Content > Landing Pages. The Landing Pages report lists the top pages your customers are landing on. Look for high bounce rates on "table of contents"-type pages, such as category or section pages. These pages tend to get a high number of sessions. If one also has a high bounce rate, consider making changes to it to improve information discovery. In-page Analytics lets you see the links users click the most on each page in your Help Center. The information can provide insights into your most popular content as well as uncover problems with customers not following links to your most important content. Note: Before you can use the In-Page Analytics metric, you must install the Chrome extension. After installing, open the extension in a separate window than your Help Center. For more information see Google Analytic's documentation, Page Analytics (by Google). In Google Analytics, click the Admin tab at the top of the page. In the Property column with your Help Center selected, select Property Settings. For Default URL, make sure the default URL starts with HTTPS, not HTTP, if you have Help Center. For Default Website, make sure All Web Site Data is selected. In the In-Page Analytics section, select Start In-Page Analytics In > Full View Mode. In the Google Analytics dashboard, navigate to Behavior > Site Content > All Pages, then select the landing page that you want to analyze. Click the In-page tab on the upper side of the dashboard. The information helps you better understand what customers are looking for and what they may be struggling to find. Typically, links and content placed higher on a page (known as "above the fold") get a higher percentage of clicks. Whenever possible, place links to your most important content above the fold. For example, take a look at the Help Center of one of our customers, BetterCloud, below. 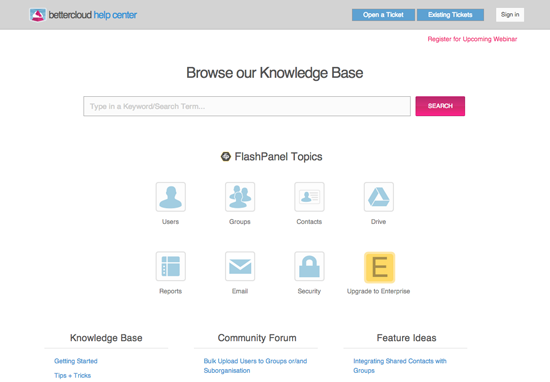 BetterCloud customized their Help Center with eye-catching icons based on popular support topics. If for some reason the icons are getting a low percentage of clicks, there may be an issue with the relevancy of those topics. In-page analytics is also a great way to test out a new design element or call-to-action. Looking at the BetterCloud example again, you can see they’ve included an upsell opportunity in the icon at the lower-right labeled “Upgrade to Enterprise”. By looking at the percentage of clicks the icon receives, BetterCloud can find out whether or not this type of call-to-action works in their Help Center. Pages per Session is the average number of pages viewed during a session on your Help Center. While the overall number is an useful metric to pay attention to, it’s also interesting to look at the devices your customers use to access your Help Center. As customers grow increasingly mobile-savvy, you can look at pages-per-session through the lens of mobile device usage. For a report that breaks out pages-per-session by type of device, navigate to Audience > Mobile > Overview in the Google Analytics dashboard. Usually, desktop users have higher pages per session than tablet, and tablet have higher pages per session than mobile. If you notice a high number of customers accessing your Help Center using mobile devices, you may want to focus your resources on optimizing the navigation experience for mobile. Check out this tip of the week on using mobile CSS for responsive site design. Guys, i wasn't able to find it so my question is this. Is there a way to force zendesk to provide full URL's in google analytics hits? Why? We segment our traffic based on views, not properties (with a unique UA-code) because it allows for much better tracking of subdomain and overall traffic patterns from different parts of the site. Hey Stas! Just to clarify, does that note at the top of your comment mean you were able to get this sorted out on your own? Fabulous. :) Let me know if you need anything else! "Access denied. 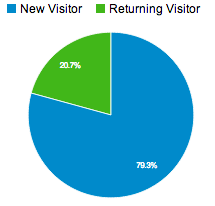 Please try relaunching In-Page Analytics from the report. [Error: 20006]"
any clue how to solve it? This sounds like a very specific issue - I'm creating a support ticket to help handle this request request and follow up with some questions. Thanks for your attention Dwight!! General question - I can't find this answer anywhere. We have a lot (hundreds) of agents working in our support operation, and they frequently use the documention. 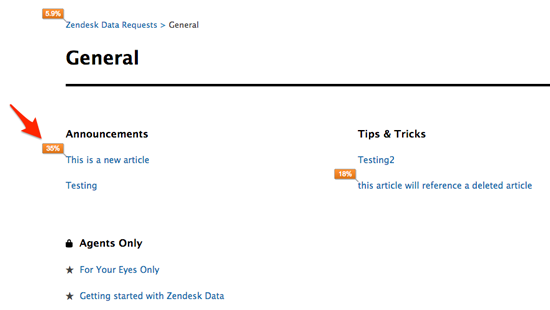 When it comes to reporting, would the Zendesk Helpcenter distinguish between end users/visitors, and agents? Else, at the minimum, would it exclude agents from reports? It's not possible to differentiate between Agent/ End-user sessions using the native Help Center reporting, however one of our Help Center gurus suggested a good alternative. If you'd like to use Google Analytics to report on only your end--user activity, you can use the helpcenter.user.role value to conditionally run some JS based on the Role that's returned. You can then wrap the Google Analytics snippet inside the conditional code so that it only runs for non-agents. Does anyone know how to find "total unique requesters in tickets"? This isn't explained in the article. You can use Insights to build a metric that counts unique Users, then slice that by Ticket Created Date. Is % New Sessions fed by IP address? I was actually curious about this myself, and my go-to guy for GA questions is on vacation, so I decided to do some digging around online. I found a really informative thread on Quora that answers the question! You can find it here. The general consensus there is that it's mostly cookies, but can also be IP address or some other facts, depending on the device the user is using and what your settings are. I had no idea that cookies had anything to do with it, so I learned something today, too! Quick question about the self service score. Looking at a range of Jan 1 2017 to Jul 22 of 2017, we had 14,414 users visit the help center. In that same range, we had 2,947 tickets created. Going by the math above, that means our self service score is a 4.8? Your math is right, it's just how you're interpreting it that's off. A self service score of 4.8 means that for every 4.8 (or you can round up to 5) users that come to your site, only one submits a ticket. That's a pretty good rate! "You can also drill down in the % New Sessions metric by Help Center categories, sections, articles, or questions. Use the information to map the content that's used by first-time users and returning ones." Where can I find the help center categories, sections, etc. in Google Analytics? Sorry to leave you hanging - Google Analytics has changed some since this article was published, but I've been trying to figure this one out for you. I know that if you go into Behavior > Content Drilldown, you can start to get into the categories, sections, articles, and questions. But it doesn't seem like it shows new vs. returning users at that level. So, you can get some useful data there, but not specific to that metric. I'm going to keep digging, and I'll let you know what I find. Hey Mary - update for you. As I was saying yesterday, in Google Analytics, go to Behavior > Content Drilldown. In the upper left-hand corner, you'll see a dropdown, which defaults to "Secondary dimension." Under that drop-down, scroll down to "users" and then "user type." This will then give you a list of your content, sorted by new and returning users, and then the pageviews and unique pageviews for each. I have a question on the self service score. Is there a hard rule on range of time in order to make this an effective measurement? Is looking at it MoM accurate or should I be looking at this daily. Also how effective is it if I’m only looking at unique users and measuring against how many tickets those unique users submitted? In other words not counting requesters that didn’t use help in the equation. I hope that all makes sense. Thank you, Nicole. I was able to see the breakdown of Section and Category accesses. This helps alot. You're welcome, Mary. So glad to hear it helped. @mkye86 - Can you clarify your question? Are you looking at something in Google Analytics, or are you asking about something in Insights, CSAT or NPS? Hi! I'm interested in improving our site navigation, but I'm having trouble finding the "In-Page" tab mentioned in step 2. Can someone point me to where this might be located? Hi Michelle! Welcome to the Community! Can you show me a screenshot of what you're looking at? It's hard for me to know what's happening without a little more context. that means our self service score is a 0.795?? I have only 54 users (since the activation of the helpcenter) and 142 tickers created by customers in march. That means i had a self-service score of 0.38?? Which one is the good one? How should i interpret that? I have a question about that GA data. How do you know how many of those 133 users found the KB articles helpful (solved an issue), which articles helped the most? did the user actually read the article? This seems like tough information to capture through any tool. How would you capture this? That's not something you will find in Google Analytics. You would determine how many users have found an article helpful by looking at the "was this article helpful" votes on a given article in your Help Center. As far as whether users actually read the article, you will want to look at the amount of time users are spending on the page. If it's a few minutes, most of them are probably reading the article. If it's a few seconds, they probably aren't. But there's no way to know if users actually read it other than to ask them if they did. Is In-Page Analytics still relevant now that the Page Analytics chrome extension is deprecated? You should be able to use Page Analytics extension that I've attached for you. Looks like there may have been a newer version pushed out by Google. This product has been deprecated and will no longer receive updates.